At least 248 people have been injured or suffered from tear gas exposure, according to the Gaza Health Ministry. Fifteen people have been hit by live bullets. Israeli Defense Forces have referred to the protesters as “rioters,” insisting its response was proportionate and in line with its rules of engagement. 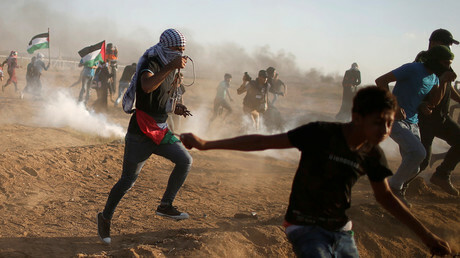 The Israeli army spokesman said that the protesters pelted Israeli forces with rocks, burn tires and threw two grenades and bombs, inflicting an injury to one Israeli soldier. The soldier had suffered a shrapnel wound and received medical attention on the spot. The situation has been exacerbated by the US recognition of Jerusalem as the Israeli capital and the grand opening of the embassy there in May, which has drawn anger from Palestinians, the entire Arab world, and even some US allies in Europe.